We've all been there: spending weeks planning, designing, and developing a new website, only to hurriedly prepare content in a last minute panic as the once-distant deadline looms ever nearer. Isn’t it time to say goodbye to publishing rushed content and missing deadlines? 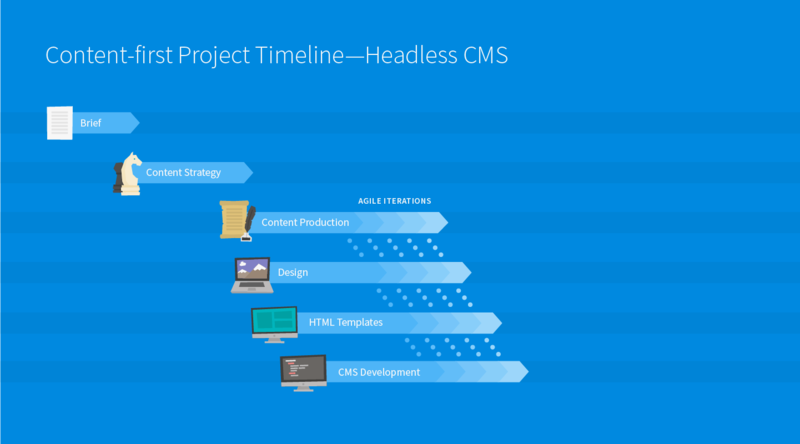 Let's take a look at how headless CMS can help you optimize your project timeline and build websites in an agile way. Headless CMS enables you to start with content, not technology. With a content-first approach and the right tools, content editors need not wait for developers to prepare templates and designs, they just tuck straight into creating quality content before any code is written! How, you ask? Well, let’s compare a typical web project plan to a headless CMS project plan and find out. Typical web project plans go hand in hand with the waterfall development model, often resulting in late content production and project delays. At the beginning of a project, the client approaches a digital agency with their goals and requirements. The agency defines a content strategy and information architecture accordingly, and designs the wireframe for the presentation layer of the new website. Now with all the necessary information, front-end developers can start coding HTML templates that will serve as a content presentation template. 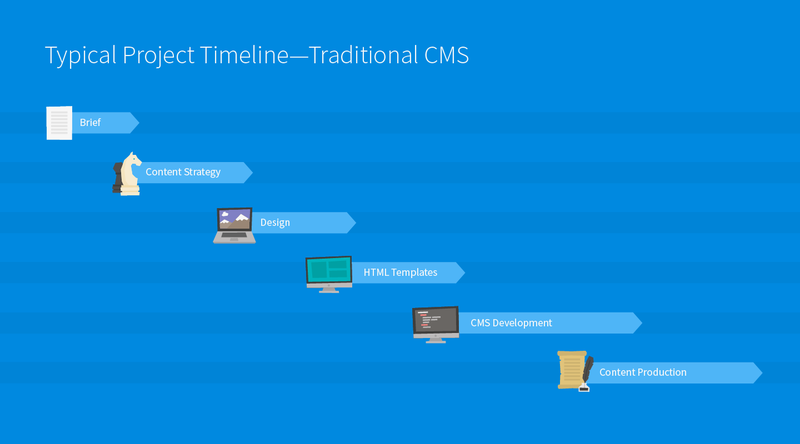 Once these are approved, back-end developers can start configuring the CMS and transforming the HTML templates into CMS templates. At this point, the client's content editors start gathering content for the new website. Usually, this is when you realize there’s more content than is possible to create in the timeframe. Or half-way through the process, new content requirements come up and may even need extra development. Either way, you're going to miss the deadline. As you can see, the typical waterfall model associated with traditional CMS mean inefficient use of time and delays, because it doesn’t allow the various roles in the team to work simultaneously and to cooperate. The benefits of a content-first approach have finally started to be recognized and, in contrast with the typical project plan, the content creators now get to work much sooner in the web production process—ideally, right after the content strategy is defined. Separating content production from development enables content editors to work alongside developers, saving time and, ultimately, money, not to mention the fact that deadlines become achievable. However, this model also has its flaws. Content is very often written and reviewed in external tools such as MS Word and Excel, or Google Docs. So, once approved, you need to migrate it to the CMS. While the commonly used external tools are fine for content creation, they aren't suitable for content migration, which can mean a very time-consuming and painful process awaits you at the end of a project. To save time on content migration by avoiding having to manually copy paste pages and pages of text, we developed Kentico Draft back in 2015. This cloud-based solution helped you prepare structured content in a separate environment, and once the content was ready, you could automatically import it into Kentico CMS. On a quest to constantly improve the web and content production process, we saw Kentico Draft as a first step towards a more sophisticated solution—Kentico Cloud, a cloud-first headless CMS. With Kentico Cloud, content editors create content in a system that's ready to go from the start, while developers iteratively build an application to deliver that content. 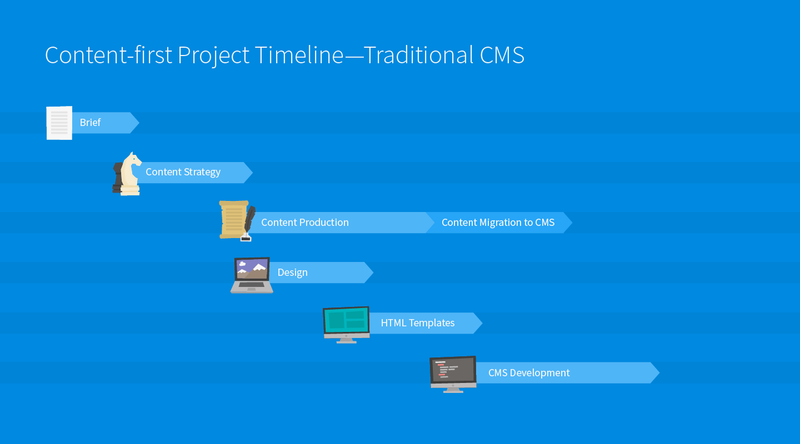 Developers love that they don't have to configure the CMS, and content editors love that content migration is a thing of the past. A Headless CMS project plan allows you to utilize agile methodologies, meaning all members of the team can work simultaneously in short iterations. Back-end developers can work on content models and write controllers, while designers augment user experience and front-end developers code templates. All the while, content editors can be preparing content in the Cloud. Moreover, different roles can cooperate much more efficiently and effectively. For example, developers can test how templates or content models fit the content that editors have been working on. When the content doesn't fit the templates, or the requirements change, these issues can be flagged and fixed at any time during the production process. When content production is separated from website development, the website delivers the content via API and displays it as soon as it’s published. In this way, headless CMS helps you avoid unpleasant surprises and the additional costs of content migration shortly before launching the site. And, you’ll deliver the project on time. Change Is Coming, Are You Ready? Regardless of your current web production process, you can be sure that it'll change somehow sooner or later. Rendering content as websites is no longer enough, as the Internet of Things creates the need for displaying content on any device and across multiple channels. Approaching content production and content presentation as two separate things allows you to deliver your digital projects much more efficiently. Not only can specialists in teams work simultaneously on both content and layout, but these two processes can both be executed in one iteration. Moreover, once content has been created once, headless CMS allows its use on multiple channels, dramatically reducing workload for marketers and developers alike. Are you ready to go agile with headless CMS? Schedule a live demo to find out more about Kentico Cloud.